In this lesson, we will learn how to evaluate numerical expressions containing absolute values and use this to solve word problems. Evaluate | − 8 | ÷ 4 × | 3 | . Evaluate 6 + | − 4 | ÷ 1 2 . Given that , what is the value of ? State whether the following is true or false: − 4 1 4 is equal to the absolute value of 4 1 4 . − | − 6 4 | = . On Wednesday, Nada deposited $27 in her account. On Thursday, she withdrew $30. 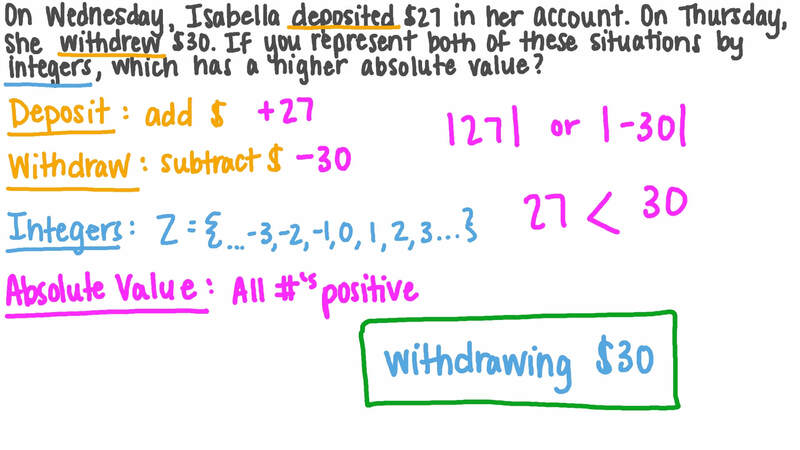 If you represent both of these situations by integers, which has the higher absolute value? Can the absolute value of a number ever be a negative number? Maged and Bassem both weigh 78 kg. Maged would like to gain weight, while Bassem wants to lose weight. They decide to go on a diet. After one month, Maged weighs 81 kg and Bassem 73 kg. What are Maged’s and Bassem’s changes in weight? Who had the larger change in weight? CIt was the same for both. Evaluate 1 2 + | − 6 | ÷ 1 2 .